It has been a very successful year for us and we are looking forward to 2010 with much anticipation. February will see the much awaited changes to the Queensland Adoption Laws and the launch of the Post Adoption Support Queensland with Susan Kelly as team leader. Details to come in the new year. Our Special Thanks to everyone who has helped us through the year. A Christmas Lunch at The Ox at Margate on 28th November was enjoyed by everyone. It was nice to have some of our Adoptees and Mothers together for our final meeting and to celebrate such a successful year. It has been a very busy year and we are very proud of our achievements. Congratulations to members of WASH (White Australian Stolen Heritage) on receiving an Apology for all Adoptees seeking an apology. Some ladies from ALAS had the privilege of watching Professor Ian Jones, on behalf of the Royal Brisbane Women's Hospital present to Victoria Fitzpatrick and Kerry Saint a long awaited apology. A very disappointed third member of the team, Therese Hawken was unable to attend due to illness. To The White Australian Stolen Heritage (WASH) group and all Adoptees seeking an apology. Thank you for meeting with me at the Royal Brisbane Women's Hospital and sharing your experiences of being an adopted one. I was saddened to hear how half truths,lies, feelings of abandonment, lack of knowledge of your origins and missed opportunities to grow up and be with your siblings, have and continue to adversely affect your lives, and many other lives of those who are near and dear to you. Our open, honest and obviously painful discussions have helped me to understand how you have been denied the right to experience the natural relationship between you and your mother, your siblings and extended family because of the practices in place at the time of your birth. Some of you were subjected to many different types of abuse; from being denied contact with your mother and by the family in which you were placed. 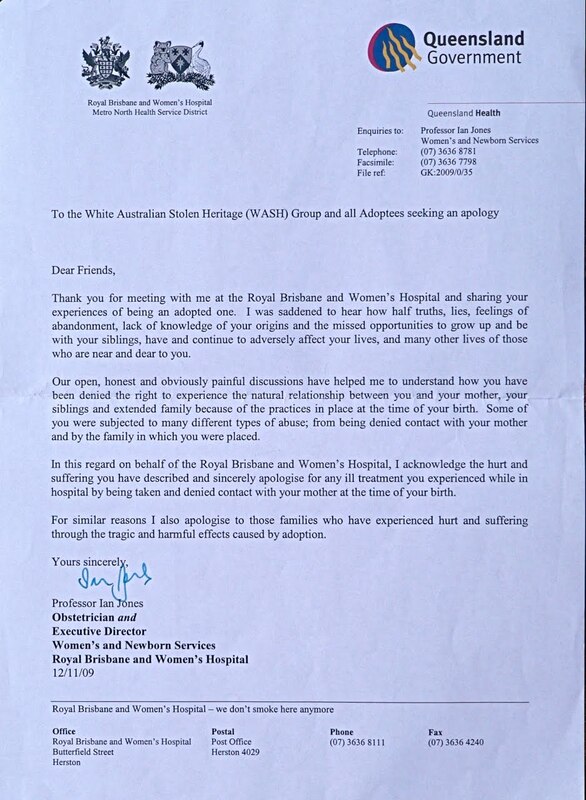 In this regard on behalf of the Royal Brisbane Women's Hospital, I acknowledge the hurt and suffering you have described and sincerely apologise for any ill treatment you experienced while in hospital by being taken and denied contact with your mother at the time of your birth. For similar reasons I have also apologise to those families who have experienced hurt and suffering through the tragic and harmful effects caused by adoption. This letter typifies the misguided concepts that were proliferated in the 60's and 70's and still exists today. Hooray for the proposed national breast milk bank (C-M, November 13). When I was having my children (now in their late 30's) at the Royal Women's Hospital, single mothers were in a special veranda ward away from the other mothers, as they were all giving their babies away for adoption. After every feed we had to express our leftover milk for the babies who were being given away (hepatitis and AIDS were far from anyone's mind). I am glad to see that babies will once again be given the best start in life they can get. This is the response I have written to the Courier Mail. I hope they print it! Over 30 years ago I was one of the mother's who "gave away" my baby for adoption. The facts are, we did not give away our babies!They were taken.Our crime was, we were unmarried. Adoption signatures were taken under the influence of strong medication. Most mothers were under age and were kept in isolation in the "special veranda ward" away from "respectable Mothers". While you were expressing breast milk for our babies, we were given drugs to dry up our milk and had our chest bound to suppress milk. We did not agree to this, in fact we were denied any contact with our babies to make sure adoption practices went ahead smoothly. Our rights as a mother were violated. My baby was born at the Royal Brisbane Women's Hospital. The Hospital has recognized the crimes relating to adoption and the never ending trauma mothers have to endure from the loss of their babies. 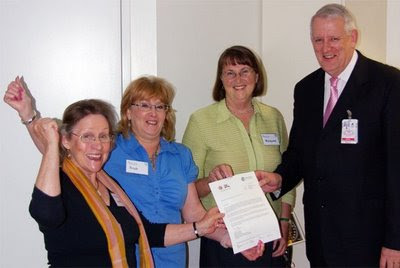 A public apology by the Royal Brisbane Women's Hospital in June 2009 was presented to mothers who were treated badly while in the care of their hospital. So you can see that, while breast milk is good, natural mothers milk is best. IT NEVER FAILS TO AMAZE ME THAT PEOPLE BELIEVE THAT "ALL" MOTHERS "GAVE AWAY" THEIR BABIES, IN EVERY HOSPITAL, IN EVERY STATE IN AUSTRALIA. Initiated Yuin Elder, Uncle Max Dulumunmun Harrison offering his support to the Apology Alliance and all member groups in gaining an apology for the White Stolen Generation. As an Aboriginal Elder, I fully understand the pain and suffering that has been done to my people in the past, and the traumatic times that we have endured. I applaud the Prime Ministers apology to our mob, but what about the White Stolen Generations that has suffered the same fate. I know many white people who has went through the same pain. So why can't this government do its healing again, and apologise th the White Stolen Generation to bring closure to all this suffering. Apology Alliance has humbly and gratefully accepted this support from Uncle Max in his capacity as Indigenous Elder. ALAS, as one of the member groups, would also like to send our thanks and appreciation to Uncle Max. Our last meeting of the year will be a Christmas celebration. Please RSVP by 25th November. Come along and help us celebrate our achievements of 2009. "I am pleased to advise the Adoption Act 2009 was passed by the Parliament on 18 August 2009. The new law will come into effect on 1 February 2010. The passage of the Adoption Act 2009 heralds the most significant reform to Queensland's adoption law in over 45 years. As Minister for Child Safety, I am honoured to have been given the responsibility of leading the debate and passage of this historic legislation through the Parliament on behalf of the Government. The Adoption Act 2009 is available for download free of charge from the Queensland Legislation website (www.legislation.qld.gov.au under 'Acts as passed for 2009) and printed copies can be purchased from the Queensland Government Bookshop (www.bookshop.qld.gov.au). A team is in place to undertake the range of activities that are required to prepare for the delivery of adoption services under the new law. The Adoption Reform Implementation Team is working closely with Adoption Services Queensland to develop the new policies and practice that will support service delivery under the new law. Now that the Adoption Act 2009 has been enacted, the reform team's priority is to develop information and resources about the changes to the law and how they affect various client groups and other people with an interest in adoption. This information will be distributed through a range of communication activities to ensure as many people as possible are aware of the changes and how they will be affected. The best source of information about the key areas of change introduced by the Adoption Act 2009 is the department's website (www.childsaftey.qld.gov.au), which will continue to be updated with new information leading up to the Act's commencement on 1 February 2010. You can also contact the Adoption Reform Implementation Team for information or confidential advice on how the law might affect you. The team's contact details are listed at the end of this letter. Until the new law takes affect in 2010, adoption services will continue to be delivered in line with the Adoption of Children Act 1964. Our next meeting will be a south side meeting. Thanks to all who attended our last north side meeting. As you see I have requested that my letter be removed from this blog. To all that commented on my personal letter, thank you. For all others, shame on you! If the comments had been on my letter I would not have had them removed. You have forced me, as a mother to return to the dark times, Silence and Isolation! It took me a long time to decide to put my very personal letter on this blog. Keep up the good work fighting, you will achieve NOTHING. Many years ago, if anyone asked me how I was, I would invariably say,"not too bad." I was not complaining about my lot in life, but I was not propelling my state of being into a positive realm.By answering in the negative, I was sabotaging my own existance, which had already been sabotaged by many negative categories, or the "nons-uns-and ins-, as I came to regard them. In 1963, the Australian culture enabled itself to take my newborn baby by treating me as non-human. By labeling me as unchaste the N.S.W.Government made laws to "protect"my baby from being mothered by his own mother. By categorising me as unfit because I was unmarried,and uncaring for the well being of my baby if I wanted to keep him, a whole scenario came into play that enabled the Church and the State to treat me in an inhuman manner. I was deemed insensitive to the needs of childless couples and inconsiderate of the needs of those who wanted my baby. I was regarded as ungrateful by a Matron who's paperwork I would mess up by my desire to have my child. I never recovered from that year. To be on the wrong side of the dominant cultural "ethic" is a totally isolating experience. My personal balance sheet was in the red, with not much hope of getting back to breaking even. In 1965 I enrolled in English 1 at the Queensland University. Nothing meritorious about my progress, as how well can you do in quantitative terms wile struggling with undiagnosed P.T.S.D. But in qualitative terms, I had begun to look at the power of the English language, and the psychologically disabling effect of the "negative spin". I determined to intercept my existence in positive terms from then on. My state of being went from "not so bad"to "fine," "great" "terrific". In the late 1970's the term "birth mother"emerged from the American lexicon. I was horrified, determined that the term must have been devised so that someone else could claim the term "mother." The shift had been accomplished- from mother and adoptive mother, it had become "birth mother"and "mother." The old labeling switcheroo had returned. I refused to accept the label "birth mother,"with its connotations of baby farms; it clearly defined temporal role in my child's life, its implications of sheer physicality and nothing more; and its put-down element of servicing the needs of the infertile.I was not, and never would be, a service provider for the infertile. Initially my complaints about the term were ignored. Again I found myself out of step with the dominant social terminology. In 1979 my world started spinning. I did not stop spinning for 4 years.I determined that only when mothers began to fight back would we be able to assert ourselves and our rights to a decent place of dignity and respect within our culture. We simply had to "come out"- whether it be in our families, our neighbourhood and clubs, so that we could find each other. "Wouldn't you think they could all work together without all that undercurrent? " But when an entire culture traumatise a class of it's citizens, it is very difficult for those citizens to regain trust in anything, let alone their fellow "traumatees." The culture that engages originally in name calling to extract the mother's babies with force and acrimony spawned a sub-class of traumatees who engaged in the name calling at other mothers. Counselling alone does not assist a mother back to "normal life. "For a start, she must be able to complete the birthing process. When it is not possible for this to happen, you have a disenfranchised mother fixed at the point of psychological development at the age when she gave birth to her stolen child The resulting damage to that mother, her family, her friendships, her work relationships, is like the ripples of a stone tossed into a pond-concentric and ever widening, until it encompasses the entire surface of the water.
" I CHOOSE TO BE CONSIDERED PART OF THE "WHITE STOLEN GENERATION." "White" in inverted commas. "White"does not determine colour in this sense; in fact white is total absence of colour. I simply refuse to be called "non-indigenous. ""Non-indigenous" is a term devised by others. It is a non-term, which I won't subscribe to. It encompasses negative nomenclature. If I am to stay positive about myself, my life, my well being, I cannot go back to being a "non-anything." Australia is my place of birth. I am a native Australian. As Tjanara Goreng Goreng says, I, as a native born Australian, am protected by the Rainbow Serpent. The Rainbow Serpent protects ALL those born in this land, without exception. The Rainbow Serpent does not enquire the colour of my skin- by virtual fact that I came into being in this land, guarantees the lessons and obligations must face, as well as the guarantees and deligations of others born here. When quizzed on the exact nature of Kevin Rudd's apology to the indigenous stolen generations, the indigenous liason officer from Jenny Macklin's office stated that all indigenous people, whether adopted of fostered, were apologised to, whether separation from their family occurred before or after the Protection Board existence. The apology was not intended to include any other class of people. So if a white mother and an indigenous father had a child taken, the child and the father were apologised to. The white mother was not. The indigenous mothers who had their babies taken after 1969, that is after the Protection Board Acts were extinguished, were taken under the Welfare Act,under which the white women lost their babies. The indigenous women and their babies were separated by the same concent takers who took the white women's babies, from the same hospitals. The indigenous women were apologised to, the white women were not. In fact, women of any colour or nationality who lost their babies- Greek, Russian, Vietnamese, Philipino, mixed race ( non indigenous) were not apologised to. I could have used the word "other." It is slowly creeping into the Australian lexicon to mean any other race besides indigenous. But Kevin Rudd's apology to the Stolen Generation was based on race and ancestry. You will have to verify this by contacting his office yourselves. Quite simply, the indigenous stolen generation were apologised to, all others were not. I am glad the indigenous mothers and children received an apology, as I know personally the liberating effect an apology from a perpetrator can have on the psyche of the aggrieved person. We were not apologised to because of the colour of our skin. Most of us who lost our babies were native born Australians. So what should we be called? Ourselves? Others? No thank you. I was not apologised to by Kevin Rudd because I had no aboriginal blood in my ancestry. Kevin Rudd and his office made the distinction. I have no concerns about that. I simply choose to call myself, "white" instead of " non-indigenous,"or "other. "All others are included in the "White Stolen Generation." Those who would not permit me to call myself "white" IN THIS CONTEXT, are themselves engaging in inverse racism. In a nutshell, all those without any aboriginal ancestry, were not apologised to. And so the Apology Alliance emerged- an inclusive group of all who were not apologised to by the Prime Minister, and who were prepared to work towards receiving an apology. The Declaration of Profound Loss united us on 21st. November 2008. To us, Adoption Awareness Week was another wound we had to deal with. No cause for celebration, but an experience of renewed grief and loss, of pain and suffering- it was like having to deal with Two Mother's Days a year instead of one. Some of our mother's are in their seventies and eighties. They need an apology NOW. They need acknowledgement that what they experienced were DARK DAYS in the history of the Australian Nation. In Geoff Rickarby's term, Australia experienced a "blip"in its psychological development. The practice of systematic child theft must never happen again. Implicit in an apology is an assurance that the culture and our laws will be vigilant in the protection of the mother-child bond now, and in the future. Our country needs a Senate Inquiry into the nature of child theft, its extent, and an ultimate call to accountability of those who engaged in the process. We do not want a watered down affair like the N.S.W. Inquiry that had many recommendations but has so far achieved a grant for a book of mother's stories, (Releasing the Past) and a grant for post adoption assistance. We need an Inquiry that gives a forum to the accounts of victims. PERPETRATORS MUST NOT BE GIVEN A VOICE THIS TIME! OUR NATION MUST CONFRONT, IN A SPIRIT OF ATONEMENT, WHAT IT DID TO ALMOST TWO GENERATIONS OF ITS DAUGHTERS,WHO WEREN'T INDIGENOUS, BUT WERE 'WHITE'. THE 47,000 INDIGENOUS CHILDREN TAKEN,HAVE BEEN APOLOGISED TO. the 180,000 "WHITE" BABIES TAKEN, ARE STILL WAITING FOR THEIR APOLOGY. 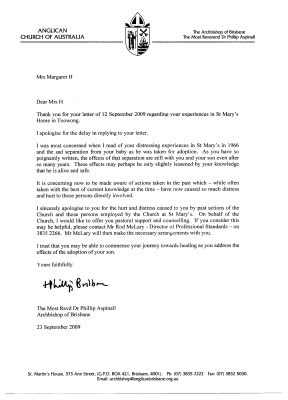 Thank you for your letter of 12th September 2009 regarding your experiences in St. Mary's Home in Toowong. I apologise for the delay in replying to your letter. I was most concerned when I read of your distressing experiences in St. Mary's in 1966 and the sad separation from your baby as he was taken for adoption. As you have so poignantly written, the effects of that separation are still with you and your son even after so many years. These effects may perhaps be only slightly lessened by your knowledge that he is alive and safe. It is concerning now to be made aware of actions taken in the past which- while often taken with the best of current knowledge at the time- have now caused so much distress and hurt to those persons directly involved. I sincerely apologise to you for the hurt and distress caused to you by past actions of the Church and those persons employed by the Church at St. Mary's. On behalf of the church, I would like to offer you pastoral support and counselling. If you consider this may be helpful, please contact Mr Rod McLary- Director of Professional Standards- on 3835 2266. Mr McLary will then make the necessary arrangements with you. I trust that you may be able to commence your journey towards healing as you address the effects of the adoption of your son. As noted in Jenny Macklin's media release. Anyone wishing to fill out a survey questionaire for a federal apology, see details listed. To be sent back by 1st October 2009. 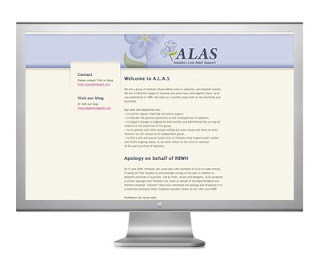 Alas is a member of Apology Alliance and as such, we are bought together with other groups around Australia under the Declaration of Profound Loss. I was in St Mary's home in 1966 and would be interest in hearing from anyone who was there about the same time to share their experiences. The pain felt by mothers giving up their children for adoption was common only a generation ago, when unmarried women were often pressured to relinquish their babies. But less understood is the emotional legacy these mothers continue to feel. Jan Russ was one of these mothers and, with playwright Robyn Bishop, turned her pain into a moving play. 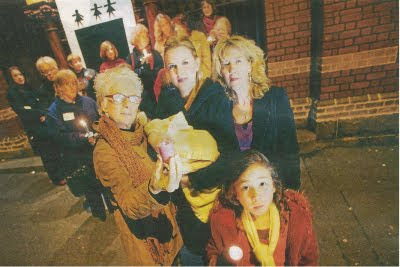 Support groups VANISH, ARMS and Alas, which campaigned for an apology for the plight of "fallen women" staged a candlelit vigil before curtain call last week in support of the play. Pictured are actress Gemma Bishop, play subject Jan Russ, playwright Robyn Bishop and Bella Cole. Trish, Janice and Margaret from ALAS QLD flew from Brisbane to attend and support the 23rd July performance of the play. We were very impressed by the honesty and emotion shown. Congratulations to all. Well done Jan! We hope to see your play in Brisbane in the future. We also enjoyed speaking with the ladies from other groups. Some members from alasqld will be traveling to Melbourne to attend a play by Jan Russ called "The Show Must Go On." It will be shown at La Mama, Carlton Courthouse,349 Drummond St., Carlton. It will be nice to meet some mothers from other support groups to see what progress they are making. We are very much looking forward to seeing the play. See you on 23rd. July! SHE IS SENTENCED FOR THE TERM OF HER NATURAL LIFE. Words similar to the above were used in the "Old Bailey" centuries ago. However even to this day, Australian women are suffering this fate, for a supposed decision they were forced to make decades ago. The majority were underage, and none had legal representation. Yes, one that is about to launch a government enquiry. We have heard about the "Stolen Generation." We are about to hear about the silent.....until now.....other Stolen Generation. The Royal Women's Hospital in Brisbane has opened the lid on "Pandora'a Box". It was the main item on channel 7 news on Wednesday 10th. June 2009. Three women were publicly presented with a written apology from RBWH. I was privileged to have been part of the negotiating team that facilitated this outcome for these wrongly maligned women. Women have suffered, in silence, decades of sorrow & the stigma of having had a child out of wedlock. If this matter is regarded as distasteful & disturbing to you, I make no apology. Queensland is 150 years in the making, we can choose to continue to live in the dark ages, which facilitated these acts of reprehensible cruelty, or acknowledge them. IS NOT PART OF THE FORUM PLEDGE? I PROMISE NEVER TO BE SILENT WHEN I OUGHT TO SPEAK OUT. Already, the letter from the Royal Women's Hospital has caused disquiet amongst the community. Some birth mothers have been threatened with restraining orders should they make contact with their sons or daughters, or in the case of some,their grandchildren. Many women were so traumertised by their experience, they were never able to have any other children. For the term of her natural life, means just that. What a sad indictment on our so called modern society. The Royal Women's Hospital in Brisbane is the first in the world to grant such an apology to those concerned. I think it is appropriate, that in QLD's 150th. year, this historic event was facilitated by Professor Ian Jones. We cannot re-write history, however, by acknowledging the wrongs of the past, we can ensure they are NEVER repeated. 1. Click on "comment" at the bottom of the article you are reading. 2. Write your message in the box titled "Post a Comment"
3. Below the message box click on the drop-down menu ("Comment as: Select profile...")and select "Name/URL" if you would like to leave your name or "Anonymous". 4. If you select "Name/URL", just write your name and ignore the "URL" field. Calling the mothers from Boothville. 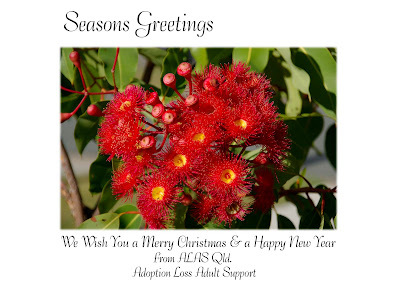 Contact Trish Mob.0417 077 159. or email alasqld through their website. Did you have a bad experience at an Australian hospital where your baby was taken for adoption against your will? How many mothers were told that they could not name their babies so their original birth certificate has no name listed? Would like to hear your comments. 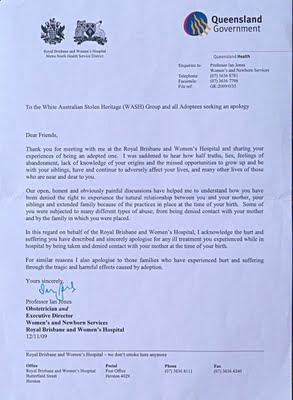 One of our mothers who negotiated the apology for our members from the Royal Brisbane Womens Hospital, has begun negotiating an apology with the manager of the Hornsby Hospital, N.S.W. Any woman who lost their babies from the Hornsby Hospital, or who were placed in the "Carramar Home" at Turramurra are invited th contact Jan through this blog site or our website alasqld.com via email.